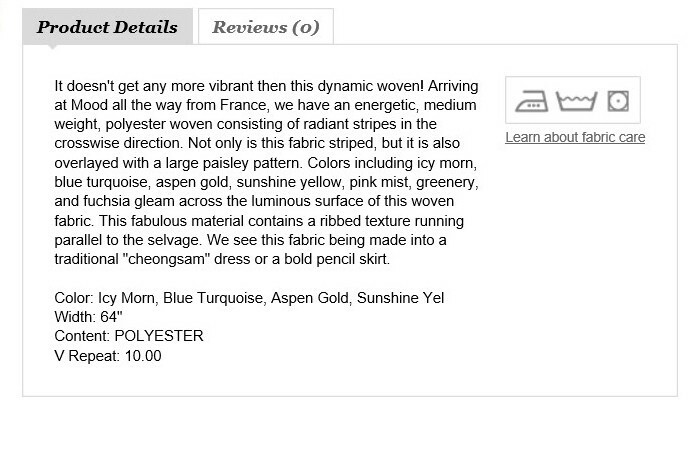 I admit, I fear purchasing fabric on line. I’m one of those touchy feely types. I like to look at fabric up close and personal. Feel it against my skin. Lay it across my arm it to see how it drapes. When one ventures to buy fabric online … you don’t get any of those experiences. So how do we buy fabric online with confidence? Over the last few weeks I’ve had several conversations with sewing friends to get their tips on how to best purchase fabric online. Using their expertise, I’ve compiled a checklist that will make fabric shopping online as painless and fearless as possible. Use online resources and read reviews – Before deciding on a specific fabric retailer search the web for customer reviews. Pattern Review is a website that not only provides reviews of patterns … but also of fabric retailers … both online and storefronts. Consumer reviews provide insight into a retailer’s business practices, product quality, and response to their customers’ concerns. This type of detailed information can help us decide if we want to shop with a particular online retailer or if we should do business elsewhere. Investigate the return policy – Just like many online retailers the return policy will vary from fabric store to fabric store. Some fabric stores will authorize returns, no questions asked. I ordered a linen shirting from Fabric.com and I was extremely disappointed when I opened the box. Had I followed tip #3, I could have averted this problem … but I didn’t. Luckily, Fabric.com has a no questions asked return policy, as long as the fabric is returned within 30 days. Emmaonesock has a similar policy. To order with confidence review the return policy before completing your order. Review the fabric details – It is such fun to peruse fabric on websites! With the vast online selection it’s easy to get caught up in the beauty of the fabric and forget to look at the very important details that are important to garment construction. Only shop at websites that offer the complete fabric details, and customer reviews. Look for a full description of the product including width, fabric content, and color. Also look for any additional detailed description(s) that could be helpful. Here’s an example from Moodfabrics.com. The description above is comprehensive. It details not only the stripe that is visible in the pictures but the fabric overlay that is not as visible. There won’t be any surprises when you open this box of fabric. 4. 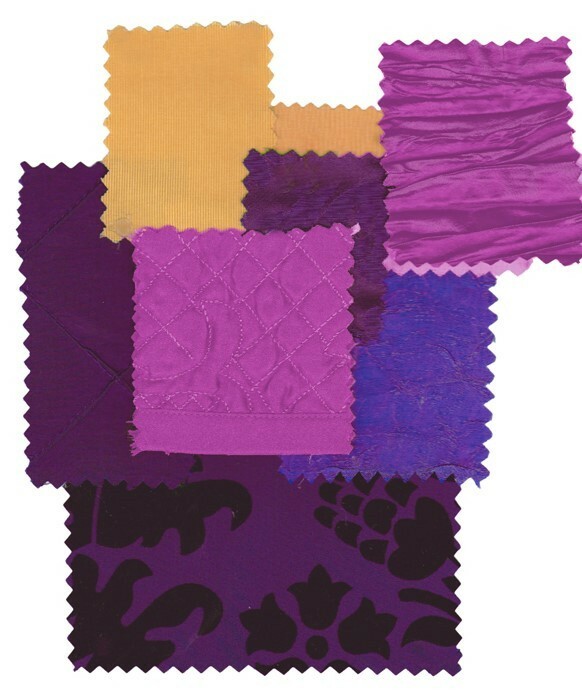 Order a swatch – Depending on the needs for your project, fabric can be a significant investment. One way to safeguard that investment is to order a swatch. Most sites offer swatches for a nominal fee, while others don’t charge for them at all. 5. Sign up for Coupons & Special Offers – Online retailers offer a variety of coupons and special offers. Fabricmart has a club that offers free swatches, discounts, and special pricing, while Fabric.com and Harts Fabric both have points programs. And though we all want to reduce the amount of emails in our in-boxes, signing up for email newsletters like Hawthorne Threads will put you first in line for new arrivals. This isn’t a comprehensive list but it will definitely boost your confidence before filling your shopping cart. 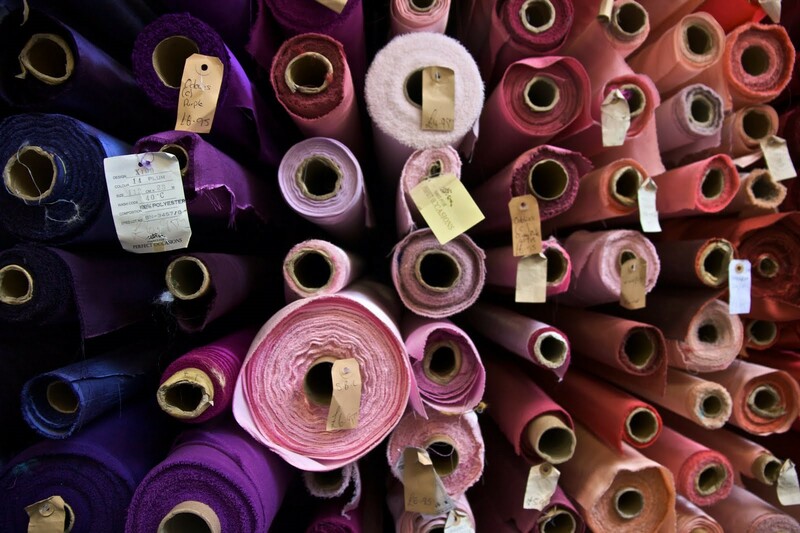 Do you have suggestions for fabric shopping online? Please share them in the comments section below. I also buy from http://www.fashionfabricsclub.com and am a sucker for fabric mart’s 1.00 and 1.99 sale section! http://www.hancocks-paducah.com is an eye candy feast for quilt fabric. Thanks for this advice for buying fabric online. It’s nice to know that some places allow you to order a swatch, and some don’t charge for them. This seems important especially if you want to be sure the fabric will feel nice to you. Next Next post: It’s A Sewing Party!! !